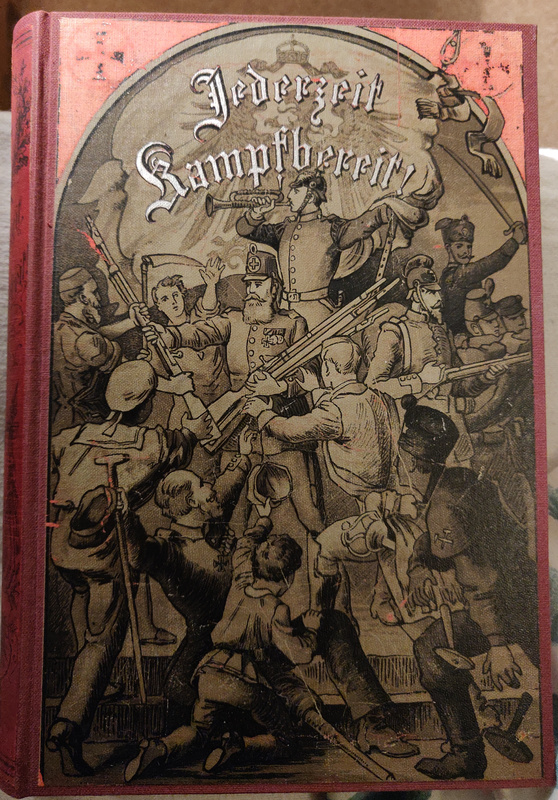 Endlich habe ich genug Freizeit um “Jederzeit Kampfbereit” zu lesen. Unten ein Gedicht aus dem Buch, in meiner besten Kurrentschrift. 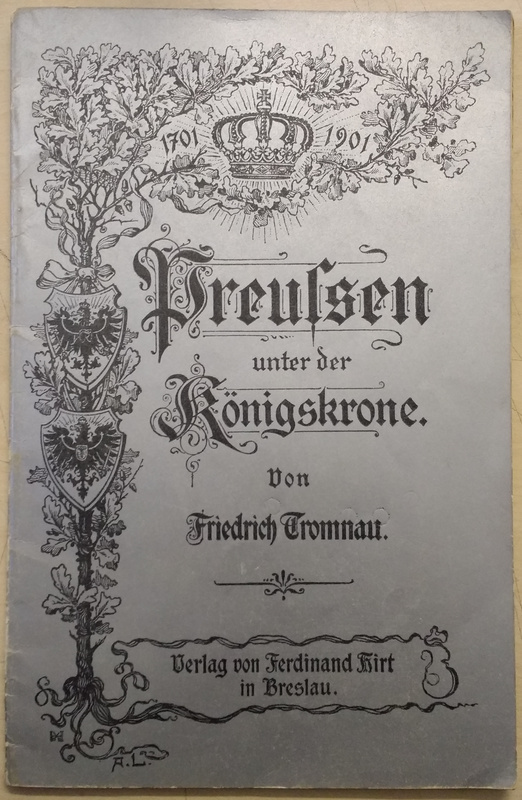 Yet another cheapish aquisition, “Preußen unter der Königskrone”. The girl’s name appears to be in Latin and not Kurrent, a different hand, or standard practice perhaps? 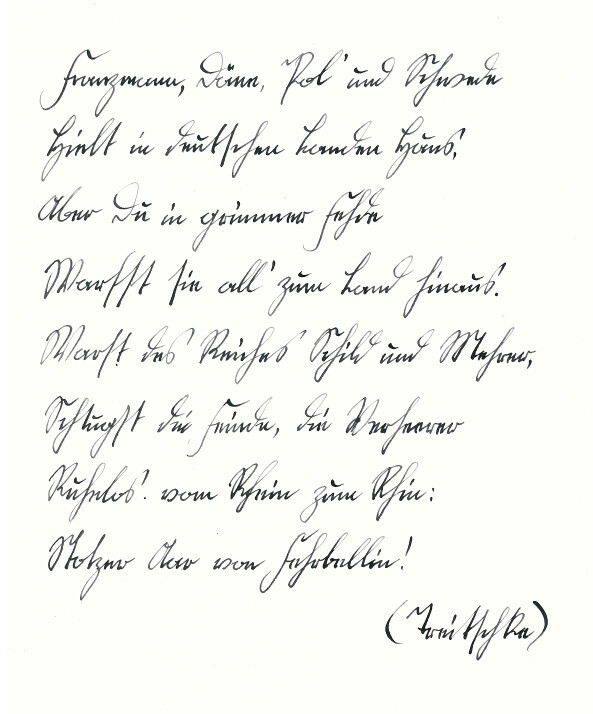 I thought I’d add this here as I was looking for a quote to submit for possible inclusion into a book about the alte deutsche Schrift and liked this, but couldn’t find an exact attribution anywhere, so found it in my own copy of ‘Fürst Bismarcks Briefe an seine Braut und Gattin‘. Eventually. Fürst Bismarcks Briefe an seine Braut und Gattin, J.G. 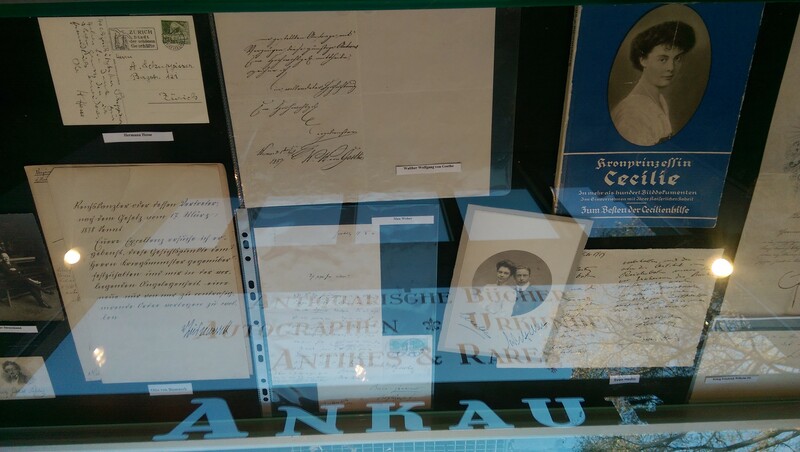 Cotta`sche Buchhandlung Nachfolger, Stuttgart 1900. Letter #177, 14.5.1851, Page 277. Firstly, it’s 210 bloody years old! Which to me is quite amazing. Where has it been all these years? Who has read it before? 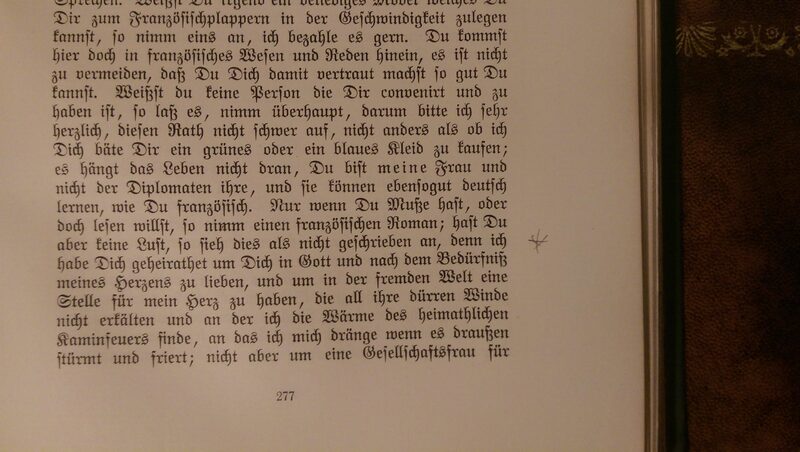 a small Kurrentschrift ‘e’ which went on to become the umlaut, and the strange ‘x’ symbol (image left, at the end of the first paragraph) that I’ve also seen in Friedrich Gerstäcker’s “Das Alte Haus” that seems to stand for u.s.w. There may yet be more to discover. 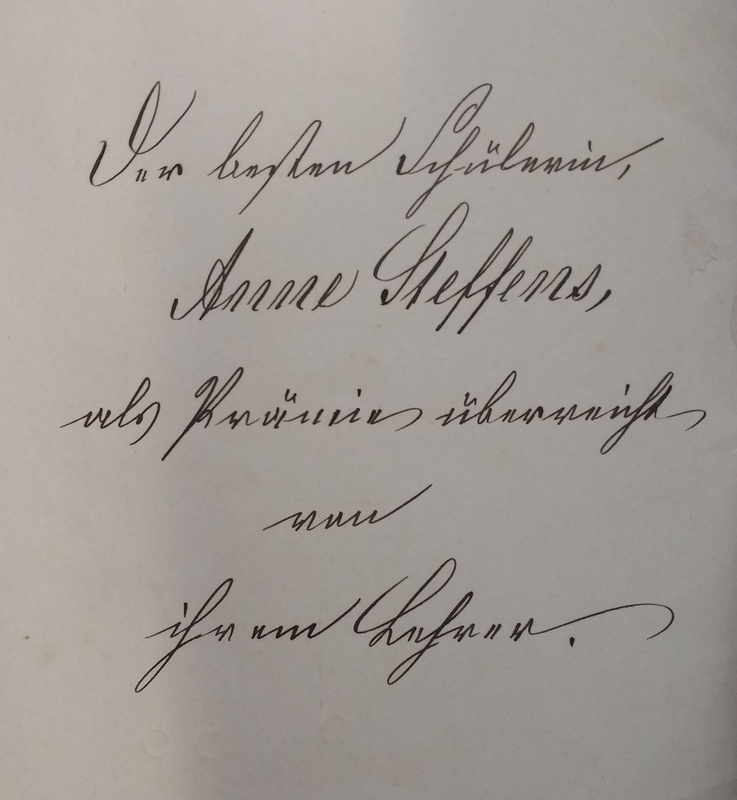 good example, the text looks like “seine Gemahlin” (his wife) in Kurrent, which makes sense as that’s what the passage covers, but why all the lines? Lost it, undoubtedly. Fourthly, it’s a surprisingly interesting read, the somewhat archaic language adding to the charm. Von Zieten would appear to have been devout and patriotic, but basically an ugly, stroppy short bloke with a massive chip on his shoulder who couldn’t handle his drink. Despite, or perhaps because of, which he turned out to be a very impressive soldier, once he’d run out of superiors to have fights with. My girlfriend has always had the same sort of relationship with her bosses. More later as I read more of it, maybe. On my trip to Hannover, a pleasant enough place but somewhat spoilt for someone of my appearance by the upcoming HoGeSa rally, I was delighted to see this shop window display. Delighted enough to go in and ask the nice lady inside in my halting German if I could take a photo. I think she doubted my sanity, as indeed do I sometimes. 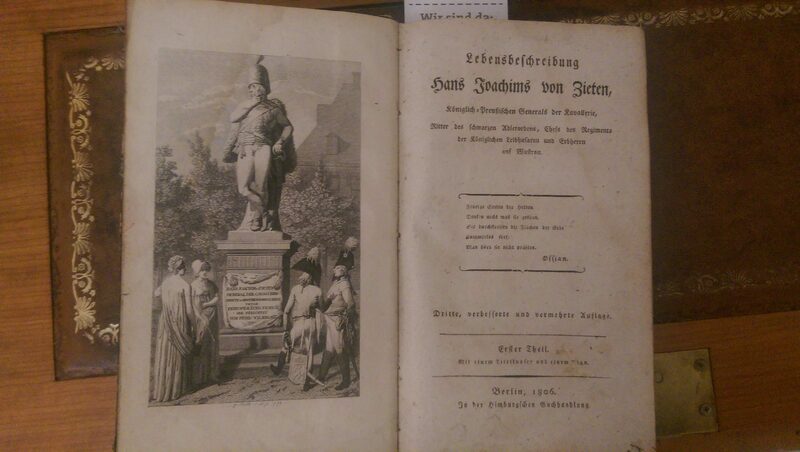 Anyway, signed letters from Hesse, Bismarck and Goethe, particularly interesting to me was the Bismarck one, as a historical item in itself, and also for the lovely script, however the lady didn’t know the price. My intention was to contact them online when I got back to England, but stupidly I didn’t write the name of the shop down and now can’t find it.